A romantic week that is affordable and includes the best of Moorea and Bora Bora. One of our most popular Tahiti Honeymoon packages. Your honeymoon begins with your nonstop flight on Air Tahiti Nui to the exotic splendor of Tahiti. You’ll be greeted with a fresh flower lei by our smiling hostess. 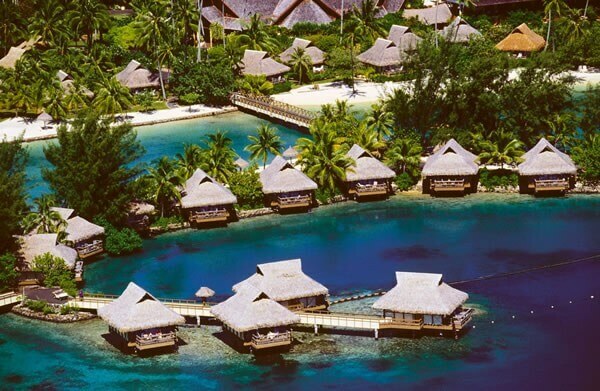 Experience the magic of Moorea – you’ll spend three nights at the luxurious Intercontinental Moorea Resort & Spa. This beautiful, verdant island invites you to discover many of the secrets that have drawn romantics to its shore since the days of Captain Cook. Enjoy your snorkeling excursion, and the incredible Polynesian performance at the Tiki Village. Your honeymoon continues as you depart Moorea for the island of Bora Bora – surrounded bythe South Pacific’s most beautiful lagoon. With four days on this exotic island at Le Maitai Polynesia, you’ll have time to create your own special memories that will last you a lifetime. The shark and ray snorkel safari is sure to be one of the trip’s highlights. Consider upgrading to an overwater bungalow for the ultimate experience.